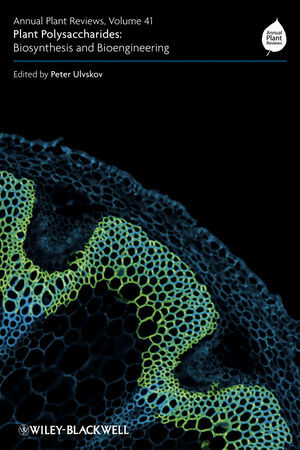 Plant Polysaccharides, an exceptional new volume in Wiley-Blackwell’s successful Annual Plant Reviews series, covers the polysaccharides and proteins that form the fundamental architecture of the plant cell wall, and the genes that encode the cellular machinery that synthesizes them. The volume focuses on the evolution of the many families of genes whose products are required to make a particular kind of polysaccharide, bringing attention to the specific biochemical properties of the proteins to the level of kinds of sugar linkages they make. Beautifully illustrated in full colour throughout, this exceptional new volume provides cutting edge up-to-date information on such important topics as cell wall biology, composition and biosynthesis, glycosyltransferases, hydroxyproline-rich glycoproteins, enzymatic modification of plant cell wall polysaccharides, glycan engineering in transgenic plants, and polysaccharide nanobiotechnology. where plant sciences, agriculture, biological, biochemical and molecular sciences are studied and taught should have copies of this important volume. Peter Ulvskov is based at the Department of Plant Biology & Biotechnology, Copenhagen University, Denmark. 1 Cell Wall Polysaccharide Composition and Covalent Crosslinking (Stephen C. Fry). 1.2 The classic primary cell walls of dicots. 1.4 Taxonomic consideration of primary cell walls. 1.5 Covalent bonds between wall polysaccharides. 2 Dissection of Plant Cell Walls by High-throughput Methods (Staffan Persson, Iben Sørensen, Isabel Moller, William Willats and Markus Pauly). 2.3 Structural determination of oligosaccharides. 2.4 Fourier transform infrared spectroscopy (FTIR). 3 Approaches to Chemical Synthesis of Pectic Oligosaccharides (Sergey A. Nepogodiev, Robert A. Field and Iben Damager). 3.2 Pectic polysaccharides: structures and availability of fragments from natural sources. 3.3 Reported preparations of pectic oligosaccharides by chemical synthesis. 3.4 Oligosaccharide synthesis – basic principles and key features. 3.5 Synthesis of homogalacturonan fragments. 4 Annotating Carbohydrate-active Enzymes in Plant Genomes: Present Challenges (Pedro M. Coutinho and Bernard Henrissat). 4.2 CAZy: what's behind the name? 4.3 Plant CAZymes: the quest for 'function'. 4.4 Plant CAZymes: problems in functional annotation. 5 Biosynthesis of Plant Cell Wall and Related Polysaccharides by Enzymes of the GT2 and GT48 Families (Bruce A. Stone, Andrew K. Jacobs, Maria Hrmova, Rachel A. Burton and Geoffrey B. Fincher). 5.2 Structures and distribution of ß-d-glucans synthesized by GT2 and GT48 enzymes. 5.3 Early biochemical approaches to plant ß-d-glucan synthases. 5.4 Functional genomics and the identification of GT2 cellulose synthases. 5.5 Identification of the functions of other GT2 enzymes from plants. 5.6 Comparative genomics and the identification of GT2 (1,3;1,4)-ß-d-glucan synthases. 5.7 Genes for GT2 synthases for bacterial (1,3)-ß-d-glucans and related polysaccharide. 5.8 Enzymic properties and catalytic mechanisms of the GT2 proteins. 5.9 Subcellular locations of GT2 enzymes in plants. 5.10 Proteomics and biochemical approaches to the identification of GT48 (1,3)-ß-d-glucan synthases from plants. 5.11 Enzymic properties of the GT48 proteins. 5.12 Future role of biochemistry in the characterization of GT2 and GT48 enzymes. 5.13 Applications of modified levels of plant ß-d-glucans. 6 Glycosyltransferases of the GT8 Family (Yanbin Yin, Debra Mohnen, Ivana Gelineo-Albersheim, Ying Xu and Michael G. Hahn ). 6.2 Phylogeny of family GT8. 6.3 GT8 clades related to plant cell wall polysaccharide synthesis. 6.4 GT8 clades not related to cell wall synthesis. 7 Genes and Enzymes of the GT31 Family: Towards Unravelling the Function(s) of the Plant Glycosyltransferase Family Members (Jack Egelund, Miriam Ellis, Monika Doblin, Yongmei Qu and Antony Bacic). 7.2 Identification and characterization of the first ß-(1,3)-GalTs. 7.3 Grouping of accessions based on their phylogenetic relationship. 7.4 Conserved motifs and implications for catalysis. 7.5 Domains conserved within the plant-specific clades. 8 Glycosyltransferases of the GT34 and GT37 Families (Kenneth Keegstra and David Cavalier). 9 Glycosyltransferases of the GT43 Family (Nadine Anders and Paul Dupree). 9.2 GT43 glycosyltransferases in plants – putative ß-1,4-xylosyltransferases. 9.3 GT43 glycosyltransferases in animals – ß-1,3-glucuronosyltransferases. 10 Glycosyltransferases of the GT47 Family (Naomi Geshi, Jesper Harholt, Yumiko Sakuragi, Jacob Krüger Jensen and Henrik Vibe Scheller). 10.2 Phylogenetic analysis of CAZy GT47. 10.7 Subcellular localization and protein–protein interactions. 11 The Plant Glycosyltransferase Family GT64: in Search of a Function (Ellinor Edvardsson, Sunil Kumar Singh, Min-Soo Yun, Agata Mansfeld, Marie-Theres Hauser and Alan Marchant). 11.2 GT64 family members are found in a diverse range of species. 11.3 The Arabidopsis GT64 family. 11.4 Possible activities of the plant GT64 enzymes. 12 Glycosyltransferases of the GT77 Family (Bent Larsen Petersen, Kirsten Faber and Peter Ulvskov). 12.2 The oldest cell wall. 12.3 Pfam and fold prediction. 13 Hydroxyproline-rich Glycoproteins: Form and Function (Marcia J. Kieliszewski, Derek T.A. Lamport, Li Tan and Maura C. Canno). 13.3 Molecular function, biological role. 14 Plant Cell Wall Biology: Polysaccharides in Architectural and Developmental Contexts (Maureen C. McCann and J. Paul Knox). 14.2 Plant cell wall biology basics. 14.3 Analytical tools to study cell wall microstructures and the diversity of cell wall architectures. 14.4 Cell wall architectures: primary cell walls. 14.5 In vitro polysaccharide composites. 14.7 Cell wall architectures: secondary cell walls. 14.8 Prospects for plant cell wall biology. 15 Enzymatic Modification of Plant Cell Wall Polysaccharides (Jens Øbro, Takahisa Hayashi and Jørn Dalgaard Mikkelsen). 16 Production of Heterologous Storage Polysaccharides in Potato Plants (Xing-Feng Huang, Jean-Paul Vincken, Richard G.F. Visser and Luisa M. Trindade). 16.2 Starch: native and modified starch, consequences for its properties. 16.3 Production of novel storage polysaccharides in plants. 17 Glycan Engineering in Transgenic Plant (Muriel Bardor, José A. Cremata and Patrice Lerouge). 17.2 N-glycosylation: a major post-translational modification of secreted proteins. 17.3 Strategies for glycan engineering in transgenic plants. 18 Polysaccharide Nanobiotechnology: A Case Study of Dental Implant Coating (Marco Morra, Clara Cassinelli, Giovanna Cascardo, Hanna Kokkonen, Juha Tuukkanen, Claudio Della Volpe, Stefano Siboni, Giordano Segatta, Marco Brugnara and Giacomo Ceccone). 18.1 Introduction: titanium dental implants and surface modifications. 18.2 Rationale for the surface modification of titanium dental implants by nanolayers of MHRs. 18.3 Surface modification of titanium dental implants by MHRs.